William Skinner appointed Bosbury vicar, 1764. Commission for collating William Skinner M.A. This document is signed and sealed by the Bishop of Hereford, James Beauclerk. James by divine Commission Bishop of Hereford. To our beloved in Christ Humphry Wishaw, Clerk, Master of Arts, Uvedale Hyksin, Doctor in Divinity and William Willim, Clerk, Master of Arts, Canons or Prebendaries of the Cathedral Church of Hereford, Greeting. Whereas we have freely and out of mere good will determined to confer on William Skinner, Clerk, Master of Arts, the Vicarage and Parish Church of Bosbury in the county and diocese of Hereford, now vacant by the death of Matthew Browne, Clerk, the last Incumbent thereof and to our Collation or Patronage in full right belonging by virtue of our Bishoprich. 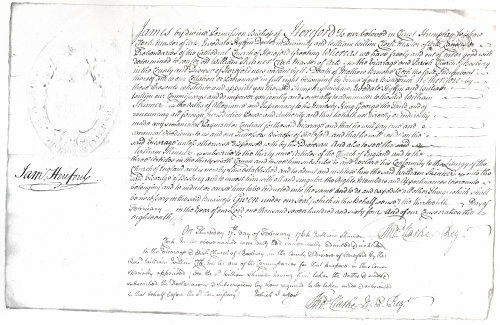 We therefore by these Presents constitute and appoint you, the said Humphry Wishaw, Uvedale Hyksin and William Willim, our Commissarys, and do impower you jointly and severally to administer to the said William Skinner the Oaths† of Allegiance and Supremacy to his Majesty King George the Third and of renouncing all foreign Jurisdiction, Power and Authority and that he hath not directly or indirectly made any simoniacal* Payment or Contract for the said Vicarage and that he will pay true and canonical Obedience to us and our Successors, Bishops of Hereford, and that he will reside on the said Vicarage, unless otherwise dispensed with by his Diocesan. And also to see the said William Skinner subscribe to the thirty nine Articles of the Church of England and to the three articles in the thirty-sixth Canon†† and to see him subscribe to and declare his Conformity to the Liturgy of the Church of England as it is now by Law established and to admit and institute him the said William Skinner into the said Vicarage of Bosbury and to invest him with all and singular the Rights, Members and Appertinances thereunto belonging and to induct or cause him to be inducted into the same and to do and expedite all other things which shall be necessary in the said Business. Given under our Seal which in this Behalf we use, the thirteenth day of February in the Year of our Lord one thousand seven hundred and sixty four and of our Consecration the eighteenth. On Thursday 17th day of February 1764, William Skinner Clerk, M.A. above named was duly and canonically admitted & instituted to the Vicarage and Parish Church of Bosbury in the County and Diocese of Hereford by the Revd. William Willim, Clerk, M.A. one of the Commisseries for that purpose in this concern specially appointed (he the said William Skinner having first taken the Oaths & made & subscribed the Declaration and Subscriptions by Law require to be taken, made & subscribed in that behalf before the said Commisary) which I attest. † The Oaths included the Oath of Allegiance to the Sovereign (Canon C13), the Oath of Canonical Obedience to the Bishop (Canon C14(3)) and the Declaration of Assent to the faith of the Church (Canon C15) which was acceptance of the thirty-nine Articles of Religion. The latter were drawn up, in Latin, by the Church in convocation in 1563 on the basis of the 42 Articles written by Archbishop Cranmer in 1553. Clergymen were ordered to subscribe to the thirty-nine Articles by Act of Parliament in 1571, when the Articles were translated into English, and this requirement for the oaths and acceptance still exists today (2016). * Simony meant the buying or selling of ecclesiastical privileges. †† The three Articles of the 36th Canon (1603) which the appointee had to subscribe to by signature, cover the sovereign’s position as supreme head of the Church of England, the use of the Book of Common Prayer and that the Thirty Nine Articles of Religion are agreeable to the word of God.